Sara Leighton ran SaraSara’s, on Main Street, Blue Hill, for 16 years. The boutique will close January 18, and Leighton will spend her weekdays caring for her new grandson, Hayden. SaraSara’s, a downtown institution on the corner of Main Street and Parker Point Road, will close its doors on Friday, January 18. “I have a new job,” said owner Sara Leighton. 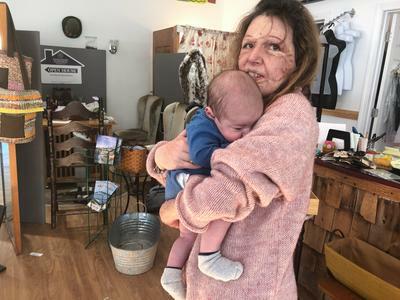 The evidence was sleeping in her arms, her 10-week-old grandson, Hayden, whom she will watch when her daughter returns to work after maternity leave. For 16 years, SaraSara’s offered clothing and other boutique items, provided a drop-off and pick-up location for dry cleaning, and, since August 2017, housed Leighton Jewelry and Design, owned by Brett Leighton (possibly a distant relation to Sara Leighton’s husband), which has already vacated the premises. Leighton also opened, and closed, two other SaraSara’s, one in Castine from 2008 to 2014 and one in Gardiner from 2010 to 2013. “It’s been a long, wonderful run. I toyed with the idea of possibly selling or passing the reins but it didn’t feel like SaraSara’s could be run by anyone else,” she said. Leighton is also a real estate agent with Berkshire Hathaway since about 2014, she said, a position she will maintain. And while her store will be closed, she plans to be around in the days afterward in case customers want to drop off or pick up dry cleaning, as that piece of her business transitions to Blue Hill Laundry. “If the flag is out, I’m here,” she said. Until the store closes, all items are 50 percent off, and the store fixtures also have price tags affixed. She is not worried that her prime downtown location in a building owned by John Candage will remain empty. “I know something wonderful will move in,” she said.